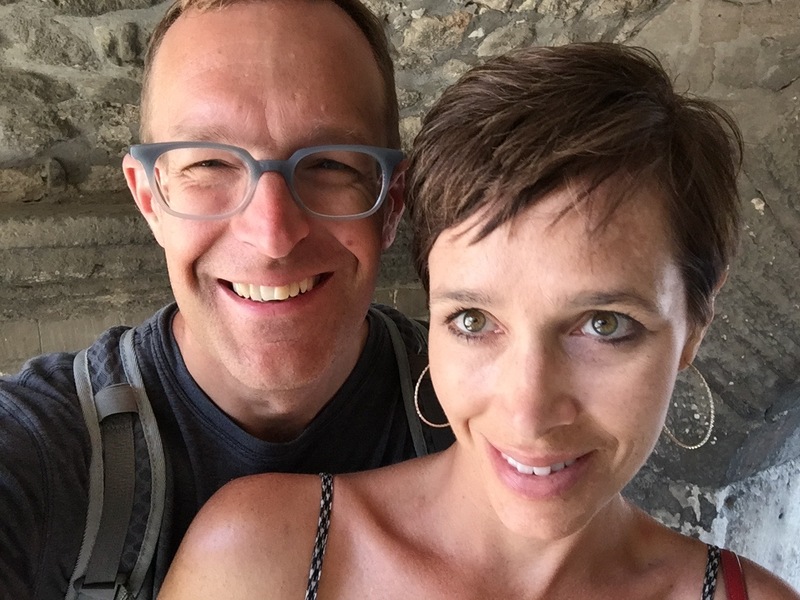 To celebrate our 20 years of marriage, Erin and I went for a holidy in southern France. It was romantic, and relaxing, and refreshing. It was hard to leave. We had considered visiting Tuscany, and I had offered Morocco and Turkey and Greece, by then we decided on Provence. Hearing this, my brother, Nick, and his girlfriend, Carolyn, suggested we stay a night or two at Maison º9, in the coastal town of Cassis. They’d stayed there last June, and recommended it as a very nice place. I booked us for five nights, found a maison in Avignon for another two nights, and a hotel in Paris for our final night. We left the family at home with Erin’s sister, Mary, then flew straight from Raleigh to Paris CDG airport, walked a few minutes over to the TGV station, and caught a fast train south to Marseille, where we rented a car, got lost immediately but chuckled when the GPS took us past the famous Marseille waterfront, and then drove east to Cassis. We arrived at Maison º9 in the late-afternoon heat, and it was perfect. It’s an old home set on a hillside overlooking vineyards, and Cynthia Kayser-Maus, an interior designer, has remodeled it and decorated it splendidly. We were shown to the lower room, in the former wine cellar. I immediately put on my new, Euro swim trunks, and climbed the stone steps to the pool, from where you can look out to the high cliffs and more vineyards that surround Cassis. 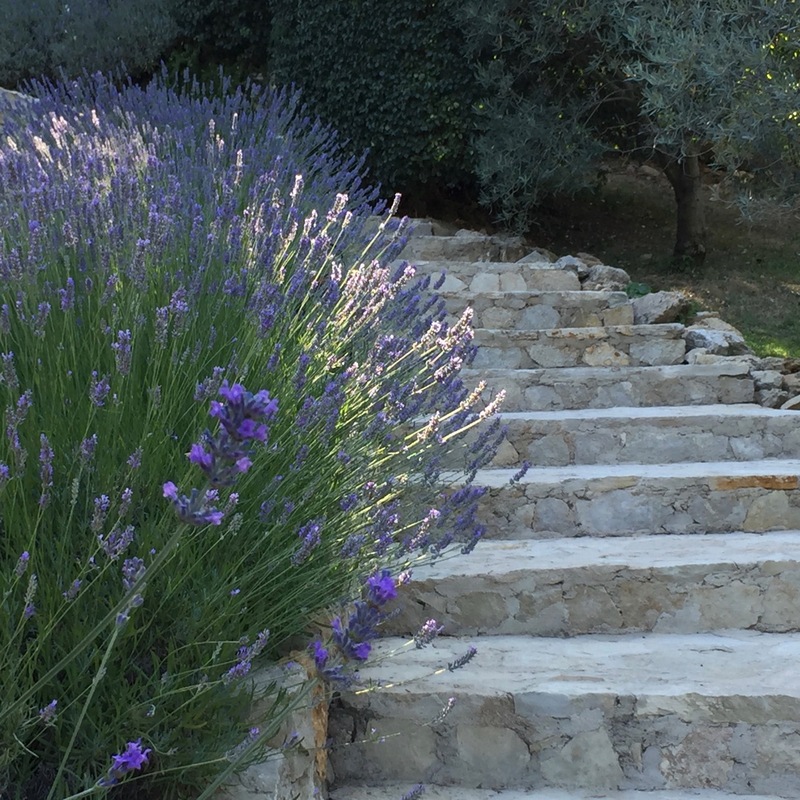 Cynthia had ordered a cheese-and-olive pizza, and set out a chilled bottle of rosé — the Cassis region is known for its rosé wines — and we enjoyed both sitting on the patio, smelling the lavender and jasmine planted all around. The buzzing of a thousand bees dancing in the lavender was a gentle wakeup the next morning. A breakfast table for the two of us was set overlooking the vineyard, and the yogurt and fresh fruit and pastries and cheese and scrambled eggs and orange juice and coffee were worth the leisurely pace we gave them. Then we spent the day by the pool. It was relaxing. I read the Alexander Hamilton biography, about his days on St. Croix, where I visited back in April. We napped, and swam. 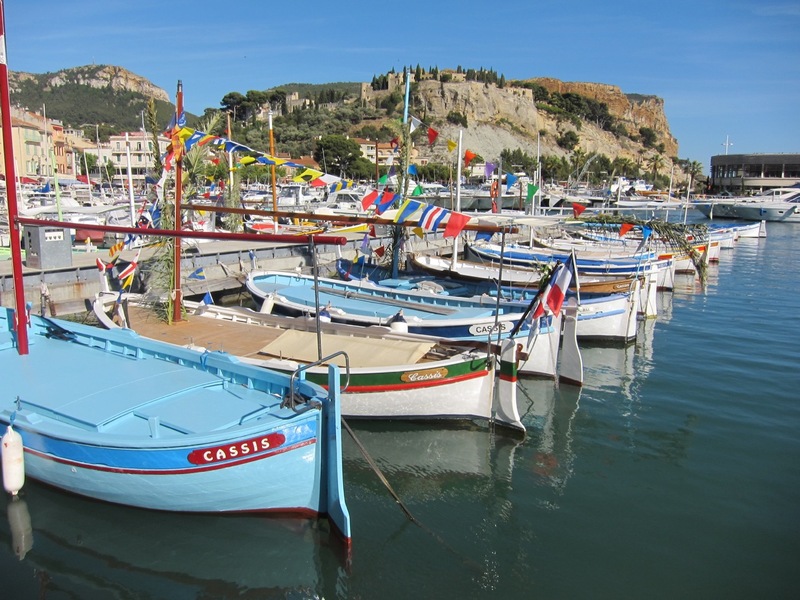 In the evening, we walked into Cassis, saw the boats in the harbor and the tourists on the beach and the lights of the castle above. We stopped for a drink, found another restaurant for dinner. We walked back to the maison, read and slept. The next days were just as sunny and warm, enjoyable and intimate. We slept in, enjoyed breakfast, walked every day, visited the wineries Domaine du Bagnol and Clos Sainte Magdeleine, bought gifts and fruit at the Wednesday outdoor market, watched EURO 2016 games, enjoyed gelato and tiramisu and baguette and brie, kayaked the calanques with the fantastic guide Renaud Kernacker, and drove to the top of Cap Canaille to snap photos of the town below. It was hard to leave the heavenly Maison º9. Like Nick and Carolyn, Erin and I will gladly recommend it to one and all. We drove away, stopping in Aix-en-Provence to walk the alleys, visit the shops, and enjoy an espresso on the main street. Then back into the car, on the search for fields of lavender, over to the famous Abbaye Notre-Dame de Senanque. A short drive back up the hills, and we stopped in Gordes, parked, and walked into the town. 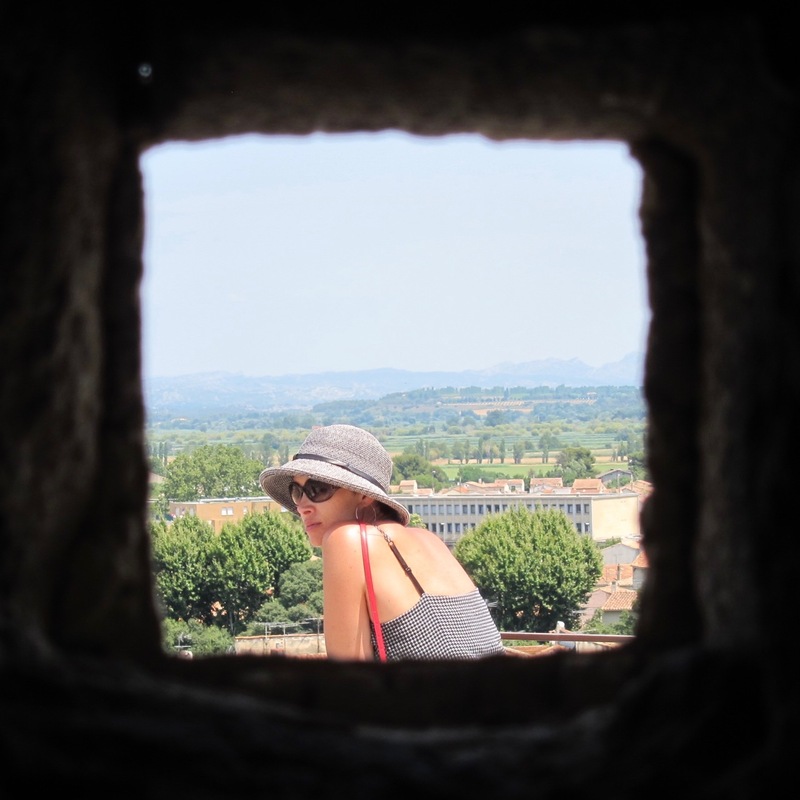 It blew us away, with its winding alleys and old church and dramatic views. Onto Avignon, where we dropped our luggage at Maison Velvet just inside the old wall, drove the car to return it at the TGV station, then took a taxi back into the old city, where we walked along the old canal, found Le Chapelier Toqué (recommended by Maya Masseboeuf at Maison Velvet), and had the most surprising and delicious meal: velvety raw scallops for me, then moist swordfish steaks topped with a Chinese sweet-and-sour sauce, and grilled vegetables so fresh and flavorful we wondered why we were the only patrons at this tiny restaurant. A most memorable meal. The next day, a walk to the indoor Avignon les Halles that reminded us of the West Side Market in Cleveland. Then a short train ride to Arles to tour the Roman amphitheatre, and buy more gifts at the outdoor market, and lunch at Le Criquet, another delicious meal — gazpacho, and pasta with prawns and broccoli — with light and tasty wine. Back in Avignon, we hiked up and around the Palace of the Popes, then met Aline Gemayel (friend of a friend) at Le Moutardier du Pape for more wine, and talk of the pending Avignon theatre festival, and American politics, and Arab playwrights from Beirut; Aline runs a project, Association TAMAM, that promotes Arab theatre. On her recommendation, Erin and I dined at le Restaurant d’Ici et d’Ailleurs; pistou, vegetable and cheese terrine, lamb tagine, roast chicken on mashed potatoes, a small bottle of Cotes du Rhone red. After dinner, a walk to see the Pont d’Avignon, and a thrilling ride on the Ferris wheel beside the river. Back on the TGV in the morning, speeding onto Paris, where it was drizzly and chilly. We walked near the Eiffel Tower, weaving amid the giddy Icelanders eager to see their team advance in the tournament (France would beat them that night, 5-2). We stopped for crepes, then returned to our tiny hotel room in the 14th arrondissement to freshen up. A short walk, and we arrived at the famous dinner party of American Jim Haynes. I’d heard his Inviting the World to Dinner essay, on NPR, back in 2009, and the timing was perfect for us to join his weekly Sunday meal, where we met other Americans, and others from Amsterdam and Serbia and England and Ireland, and a Frenchman with a houseboat on the Seine that has 2 rooms for nightly stays, and Jim’s new neighbor, a Parisian woman with a daughter who lives in Charlotte, North Carolina. The first person I meet there, though, is an American living in Chicago, who told me he knew a digital pioneer in Chapel Hill. “That’s Paul Jones,” I said. “He was my mentor in graduate school.” Erin, meanwhile, was deep in conversation with a fellow attorney who also had paid for law school with a Foreign Language and Area Studies grant from the U.S. Department of Education (Erin studied Swahili, the other woman studied Serbian, but now works for the State Department in Somalia). The next day, July fourth, we flew home. I watched Whiskey Tango Foxtrot, and Good Will Hunting, read more Hamilton, wrote about what a lovely holiday we’d just had, and felt deeply, humbly fortunate to be married to Erin, my sweetheart.